In 8-inch nonstick skillet, heat 2 tablespoons oil over medium-high heat. Cook shallots in oil 4 to 6 minutes, stirring frequently, until starting to caramelize; remove from skillet. In same skillet, add remaining 1 tablespoon oil and the mushrooms. Cook 4 to 6 minutes, stirring frequently, until tender and browned. 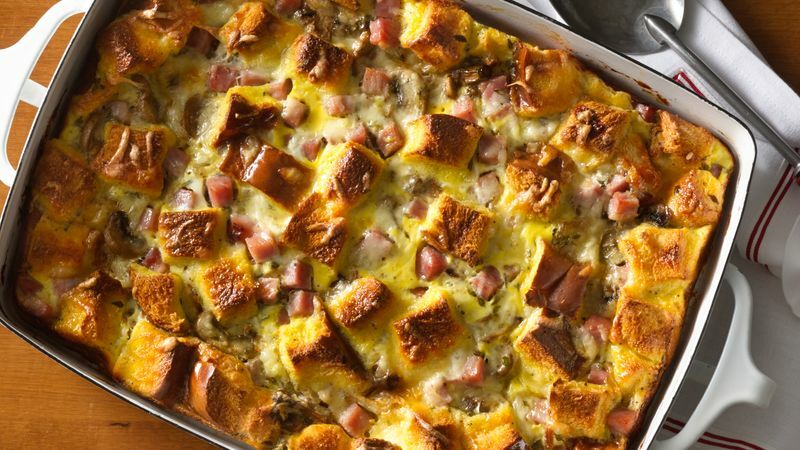 In baking dish, layer half of the bread, 1 1/2 cups of the cheese, the shallots, mushrooms, ham and remaining bread. In large bowl, beat eggs and half-and-half with whisk; beat in Dijon mustard, thyme, salt and pepper. Pour over bread mixture, pressing down slightly. Sprinkle with remaining 1/2 cup cheese. Bake 45 to 50 minutes or until golden brown and center is just set. Let stand 15 minutes before serving. Croissants are a great substitute for the challah bread in this recipe. Challah tends to be moist bread. If you have a fresh loaf, you can dry out cubed bread by baking in 200°F oven 10 to 15 minutes.